Traveling in Place, by Bernd Stiegler (Translator). U of Chicago P, 2013. Armchair travel may seem like an oxymoron. Doesn’t travel require us to leave the house? And yet, anyone who has lost herself for hours in the descriptive pages of a novel or the absorbing images of a film knows the very real feeling of having explored and experienced a different place or time without ever leaving her seat. No passport, no currency, no security screening required—the luxury of armchair travel is accessible to us all. In Traveling in Place, Bernd Stiegler celebrates this convenient, magical means of transport in all its many forms. Organized into twenty-one “legs”—or short chapters—Traveling in Place begins with a consideration of Xavier de Maistre’s 1794 Voyage autour de ma chambre, an account of the forty-two-day “journey around his room” Maistre undertook as a way to entertain himself while under house arrest. Stiegler is fascinated by the notion of exploring the familiar as though it were completely new and strange. He engages writers as diverse as Roussel, Beckett, Perec, Robbe-Grillet, Cortázar, Kierkegaard, and Borges, all of whom show how the everyday can be brilliantly transformed. Like the best guidebooks, Traveling in Place is more interested in the idea of travel as a state of mind than as a physical activity, and Stiegler reflects on the different ways that traveling at home have manifested themselves in the modern era, from literature and film to the virtual possibilities of the Internet, blogs, and contemporary art. Reminiscent of the pictorial meditations of Sebald, but possessed of the intellectual playfulness of Calvino, Traveling in Place offers an entertaining and creative Baedeker to journeying at home. 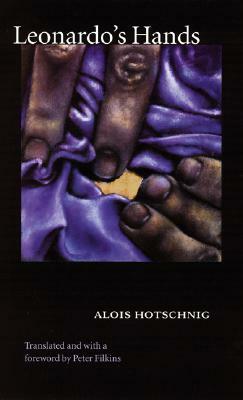 Leonardo’s Hands, by Alois Hotschnig (Translator). U of Nebraska P, 1999. Late one night a young engineer named Kurt Weyrath is involved in a highway accident that leaves a middle-aged couple dead and their twenty-four-year-old daughter, Anna Kainz, in a coma. Tormented afterward by his guilt for having fled the scene of the accident, Kurt quits his job, leaves his longtime girlfriend, and joins an ambulance service so that he might come into contact with the comatose young woman. He becomes closely involved in her life– helping with her therapies, visiting her old neighborhood, attending art classes she has taken, and searching for anyone who has known her. A year and a half later, Anna awakens from her coma, and Kurt discovers that she is a vastly different woman from the one he has imagined. The novel’s pace increases as Kurt and Anna together recover her past– and that past inexorably catches up with them.